The gentle, solitary pangolin has a tongue as long as its body and curls into a ball when threatened. It is also the world's most trafficked mammal, and threatened with extinction. In front of a drab government building near Vietnam's northern border with China, a young conservationist named Nguyen Van Thai prises open a flimsy wooden crate with a machete. He lifts out four plastic sacks and places them on the ground. From each sack he pulls out a brownish-black ball with a scaly exterior, roughly the size and weight of an curling stone. Gradually - and very, very cautiously - one of those balls begins to uncurl, revealing two blackcurrant eyes, a long snout, an even longer tail and a soft pink belly. It's a pangolin, one of the world's more remarkable creatures. The pangolin is the only mammal wholly covered in scales, and it simply curls itself into an impregnable ball when threatened by predators. It eats seven million ants and termites a year using a tongue that's almost as long as its body. It has no teeth, so it stores stones in its stomach to grind up its food. The reason many of us have never heard of pangolins is because they seldom survive in captivity. Only six zoos in the world - and only one in Europe, Leipzig - have any. Pangolins enjoy one other unfortunate distinction - they are the world's most trafficked mammal. 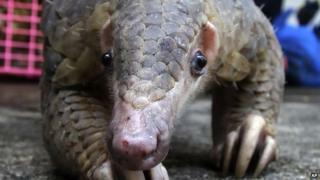 While the media focuses on the plight of the elephant and the rhinoceros, the celebrities of the natural world, roughly 100,000 pangolins a year are being snatched from the wild and sent to China and Vietnam. In both those countries their meat is considered a delicacy, and their scales are deemed to have magical medicinal properties. Already there are no pangolins left in great swathes of South East Asia, so Africa's pangolin populations are now being plundered. All eight species are threatened with extinction. As Prince William recently remarked: "The pangolin runs the risk of becoming extinct before most people have even heard of them." The four pangolins in the crate opened by Nguyen Van Thai had been confiscated by Vietnam's Forest Protection Department from two traffickers caught riding motorbikes into China along a forest track at dawn. Nguyen, who heads an NGO called Save Vietnam's Wildlife, planned to take them back to a rescue centre that he runs in Cuc Phuong national park south of Hanoi. As we drove south, he explained how pangolins - so common in his childhood - had all but vanished from Vietnam's forests and were now smuggled in by boat or truck from countries like Indonesia or Malaysia. They come in loads weighing several tons, dead and alive, fresh and frozen, gutted and skinned. Live ones are the most valuable. Before selling them traffickers often pump their stomachs full of gravel or rice starch to increase their weight. At the rescue centre we watched some of the pangolins emerge from their burrows at night, and I began to understand why those who work with them find them so endearing. They resemble artichokes on legs. They are gentle, solitary creatures with an almost comic rolling gait. They carry their young on their tails and curl round them to protect them. They use those prehensile tails to hang from branches, or to stretch out almost horizontally to reach ants' nests. Nguyen said the authorities sometimes caught the traffickers, but only because rivals had snitched on them. But they did practically nothing to stop retailers selling pangolin products. The next day he took me to Hanoi to show me what he meant. In the space of an hour we visited four randomly chosen traditional medicine shops in the city's bustling old quarter. Three produced pangolin scales, touting them as a cure for everything from cancer or acne, to poor lactation in mothers. They asked up to $1,500 (£1,000) a kilo. Asked why they were so expensive, one woman replied with no apparent shame: "Because they're rare and illegal." With equal ease we found restaurants selling pangolins to eat for $250 (£160) a kilo. One restaurant owner explained that a live animal could be brought to our table, where its throat would be slit, and the blood served as an aphrodisiac. He recommended we had the meat steamed, and the tongue chopped up for soup. He then produced a large jar of rice wine with a small, dead pangolin pickling inside it. He offered us that for an extra $200 (£130). It was a repulsive sight. The problem, Nguyen complained, was not Vietnam's poor and uneducated, but its wealthy elite - the senior government officials and the wealthy businessmen who ordered pangolin to flaunt their status or to celebrate a deal. "Ninety million Vietnamese can no longer see pangolins in their own country because a few rich officials and businessmen want to eat them," he added, angrily. "That's disgusting." Monique Pool first fell in love with sloths when she took in an orphan from a rescue centre. Since then many sloths have spent time in her home on their way back to the forest - but even she found it hard to cope when she had to rescue 200 at once. Soon sloths were hanging everywhere - from the trees in her back garden, from the bars on the living room window, and anything else they could hold on to. "Two female adults sat on the TV stand and the babies would climb on the matriarchs," she says. This was when she invented the term "slothified" as a description for her home and life.